THE SECULAR Iraqiya bloc, which came first in Iraq’s parliamentary election last March, yesterday insisted that it stood united against a second term for prime minister Nuri al-Maliki. Spokesman Haidar al-Mulla dismissed reports that Iraqiya was divided on the issue. The Turkomans themselves express it best. Outside of Iraq, they say, people know about Sunnis, Shi’a, and Kurds. But almost nothing is known about the ethnically Turkic minority known as the Turkomans. Now, in the wake of the March 7 parliamentary elections, Iraq’s Turkoman community is determined to change that picture. In the elections, the Turkomans — the second-largest group in northern Iraq after the Kurds — mostly allied with the nationalist Al-Iraqiyah list of former Prime Minister Iyad Allawi. The alliance proved surprisingly successful. Five Turkoman candidates running with Al-Iraqiyah won local elections in Kirkuk and Mosul and will represent their community in the Baghdad legislature. That compares with just one Turkoman deputy in the previous legislature elected in 2005. Now, Turkoman political leaders say, they plan to make their voice heard in the capital. And they say the neck-and-neck finish between the two front-running lists in the election gives them the chance to do it. Orhan Ketene, the Istanbul-based spokesman of the Iraq Turkoman Front, says that the Turkomans’ five deputies give “a critical balance” to Al-Iraqiyah, because the difference between Al-Iraqiyah and Prime Minister Nuri al-Maliki’s State of Law bloc is only two deputies. The Turkoman deputies hope to be part of an Iyad Allawi-led government. In other words, the Turkomans join the list of potential kingmakers in Baghdad — a position they have never held before. It is a position they share with several other, larger ethnic or sectarian groupings that are currently not tied to either of the two front-running parties. Those include the Kurdistan Alliance and the Shi’ite religious parties’ Iraqi National Alliance. All these players are currently negotiating hard in Baghdad to form a bloc large enough to get a parliamentary majority. The first chance to propose a ruling coalition goes to Allawi’s Al-Iraqiyah, as the narrow election winner. But there is nothing to rule out either defections among allies or new partnerships in bargaining that most observers expect will take months before a new government emerges. That goal, he says, is endorsed by both Allawi and Maliki. Whichever of the two leaders takes the strongest position on Kirkuk, he adds, is the one the Turkomans will follow. In addition to the five Turkoman Al-Iraqiyah deputies, another three Turkoman candidates won parliamentary seats in alliances with Shi’ite religious parties. The two groups of Turkoman deputies can be expected to make common cause over the Turkomans’ basic demands. The Turkomans’ rising political strength highlights what many analysts believe could ultimately be Iraq’s toughest hurdle on the way to future stability. That is, how to find a successful power-sharing arrangement in multiethnic, multilingual northern Iraq that can survive the withdrawal of U.S. forces. In one measure of the challenge, the top U.S. commander in Iraq, General Ray Odierno, last month reportedly proposed keeping one combat brigade in Kirkuk beyond Washington’s August deadline for withdrawing combat troops. At stake in northern Iraq is oil, and the divided city of Kirkuk is at the heart of the tensions. The Kurdish regional government wants to bring Kirkuk and surrounding Tamim Province into its self-rule region, claiming it as the Iraqi Kurds’ natural and historic capital. Iraq’s demographics present a puzzle. The Turkomans, along with Kirkuk’s Arab minority, adamantly oppose that, with the Turkomans also claiming the city as their historic cultural center. “So far, no document has ever been found indicating Kirkuk is a Kurdish region. In all historical documents, Kirkuk has been recorded as a Turkoman city,” says Muzaffer Arslan, the adviser to the Iraqi president on Turkoman affairs. Those, of course, are fighting words in Iraq and the neighboring region, where the question of whether the Kurds intend to secede from Iraq is hotly debated. But such statements help to position the Turkomans as champions of Iraq’s national unity and as the natural ally of both Allawi and Maliki, who campaigned as nationalist leaders. Arslan, who is a Turkoman advising President Jalal Talabani, a Kurd, is on the front line of the sometimes violent rivalry between northern Iraq’s two largest ethnic groups. He and other Turkoman leaders are pressing for a “special status” for Kirkuk as an alternative to either incorporating it into the Kurdish autonomous region or maintaining the current tense status quo. One model proposed in recent years has been a so-called Brussels arrangement, where political power in the city is shared according to a quota system between its communities. But if the Turkomans see the Brussels model as an alternative, a long fight looms ahead. Kurdish parties, which have at least 57 deputies in the new parliament, are expected to press hard for a referendum in northern Iraq to settle Kirkuk’s future status. Kirkuk continues to be one of the more dangerous cities in Iraq. The referendum would be in accordance with Article 140 of the Iraqi Constitution, which originally set a date of no later than the end of 2007 for the poll. The Kurds want to set a new date, while the Turkomans and many nationalist politicians in Iraq say the expiration of the deadline means Article 140 should be null and void. What all sides agree is needed to solve just about any question in northern Iraq is a census to resolve the many claims and counterclaims about which community holds a majority where. Previous censuses conducted every 10 years during the Saddam Hussein era are hopelessly unreliable because of efforts at the time to “Arabize” northern Iraq. That included registering Kurds and Turkomans as Arabs, as well as the forced settlement of Arabs from other parts of Iraq in the region. But all sides also know that conducting a fair census today in northern Iraq’s tense atmosphere is all but impossible. In a reflection of those tensions, Baghdad exempted Tamim Province from provincial elections in 2009 for fear they might spark violence. Kirkuk’s provincial parliament is still disputed, after Arabs and Turkomans largely stayed away from the first provincial election in 2005, handing the Kurds a majority. Perhaps the only certainty to emerge now with the Turkomans’ strong showing in last month’s national elections is that the community will be emboldened to organize further. The Turkomans trace their presence in Iraq to ancient times. Historical documents show Arab rulers of northern Iraq brought Turkic fighters into the region soon after the Islamic conquest to bolster their forces. That was in line with the long-standing tradition of so-called “slave soldiers” — soldiers who in many cases went on to usurp a ruler’s power for themselves. At the time of the Seljuk conquests, many more Turkic tribes moved south from Central Asia into modern Iran, Iraq, and Turkey. The tribes, from the Oghuz branch of the Turks, shared similar cultures and languages and many of those ties survive to this day. Iraq’s Turkomans — whose language is close to Azeri — mostly live in northeastern Iraq, where they enjoyed a privileged status under the Ottoman Empire. Following the collapse of the Ottoman Empire, Turkey claimed the oil-rich area around Mosul partly on the basis of the historic presence of a Turkic population. Instead, the area was included in British-mandate Iraq, whose authorities portrayed the Turkomans as distinct from the people of Turkey. Since 2003, the Turkomans have emerged from decades of cultural suppression and now have their own language schools and a television station. Their activities receive some cultural and economic support from Turkey but no financial support from Baghdad. There is no accurate estimate of the Turkoman population. Ketene puts it at some 3 million but says the true strength of the Turkoman community in Iraq has yet to be determined. That is because Turkomans not only exist in northern Iraq but historically also migrated to parts of central and southern Iraq, where they mixed with Arab tribes. He says these mixed tribes, which today speak Arabic, still feel a sense of separate identity. 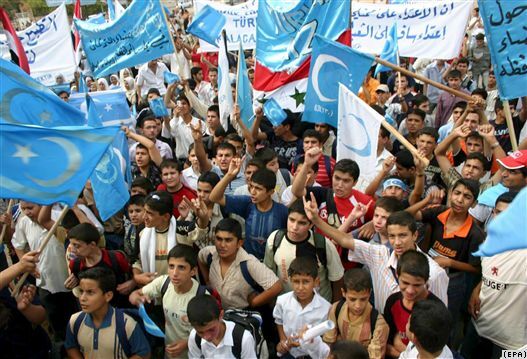 How much the Turkomans can organize politically across Iraq remains to be seen. It is something that is likely to be closely watched by Iraq’s better-known communities — the Shi’ite and Sunni Arabs and Kurds — and now, perhaps, by many who are just beginning to learn of the Turkomans as well. It has emerged that one possible explanation for the recent decision by Iraqiyya to challenge the jurisdiction of the Iraqi federal supreme court could be sheer exasperation. After a period of long silence, and without much attention from the media, the court has over the past few days quietly issued a series of opinions which must have done little to inspire confidence in its ability to act as a neutral arbiter in Iraqi affairs. The first is the much-anticipated and long-overdue response to a query from Salih al-Mutlak and Nasir al-Ani that was transferred by Ayad al-Samarraie, the parliamentary speaker, to the court on 28 February, i.e. more than one week ahead of the parliamentary elections. The two deputies were asking about the permissibility of their exclusion from the election which was based on a reference to article 7 of the constitution, which outlaws glorification of the Baath, racism and sectarian cleansing, but which also calls for a special law to implement those red lines in Iraqi politics. Mutlak and Ani asked whether one could be excluded with reference to this article at a point in time when the actual piece of legislation called for by the constitution has yet to be passed by parliament. Ayad Allawi and Iraqiyya now go strengthened into the coalition-forming process. By winning more seats than expected south of Baghdad and almost as many seats as Maliki in Baghdad, Allawi has proved that he is more than “the candidate of the Sunnis” (which was always implausible given his own Shiite background). However, the two parties that are closest to each other on many key constitutional issues (and maybe the most promising combination to get an oil law passed anytime soon), Iraqiyya and State of Law, remain at odds with each other mainly due to differences at the personal level between their leaders. In this kind of situation, probably the most logical step for Iraqiyya would be to explore the possibility of a deal with the Kurds that balances some solid concessions to Arbil with preservation of Iraqi nationalist ideals as far as the structure of government south of Kurdistan is concerned. Additional support could come either from Shiite Islamists who share the view of Iraqiyya on the importance of a centralised state in the rest of Iraq (for example the Sadrists), or, alternatively, all the small blocs in parliament joined together with Iraqiyya and the Kurds (166 seats). It is to be hoped that the ideologically contradictive scheme of a deal with ISCI (the pro-Iranian decentralist Shiite party with which Iraqiyya only shares certain ties at the personal level) will be avoided, since it would mean another oversized, ineffective government populated by parties with little in common. At any rate, ISCI now has diminishing clout within INA. Also, some uncertainty has been added to the mix due to a ruling by the federal supreme court yesterday which explicitly makes it clear that the key definition of “the largest bloc in parliament” (which is supposed to form the next government) can also include post-election bloc formation. This in turn breathes new life into the scenario preferred by Iran of the two Shiite-led blocs, INA and SLA, joining together to a single big entity, on the pattern of what happened in 2004/2005. Talks about this has come to the fore again over the last weeks as Maliki gradually realised that his ambition of going it alone, separate from the other Shiites, was not going to be fulfilled quite in the way he had foreseen. It would, however, require considerable recalibration within Shiite circles, since the Sadrists are likely to overshadow ISCI in the INA contingent, and they are not known to be keen on a second Maliki premiership. Nonetheless, the mere fact that this option is now being talked about at all signifies the big irony of these elections: Ali Faysal al-Lami, the de-Baathification director, both lost and won them to some extent. He got just a few hundred personal votes for INA in Baghdad, and will not win a seat in parliament. But through his witch hunt he forced Maliki into a more sectarian corner, and thereby prevented him from winning much-needed support north of Baghdad. 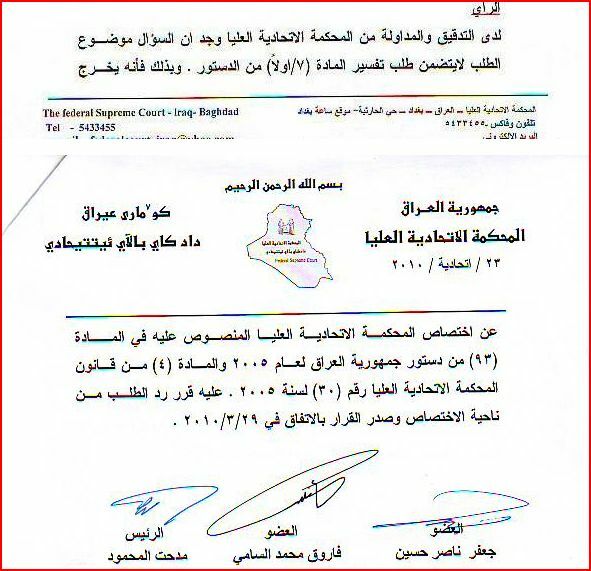 Meanwhile, the next procedural step is of a simpler character: The results will have to be formally certified in the Iraqi legal system. Only then will the clock for government formation start ticking in a formal sense. Upon certification of the results, the current president, Jalal Talabani, must call on the new national assembly to convene within fifteen days. At that point, the council will have to elect a speaker with two deputies. In theory, that election is separate from the government formation, although it seems likely that whoever is forming the next government will want allies to fill those posts: With the control of the parliamentary agenda that comes with them, they are going to be more important during the next four years than the office of the president, which now becomes a more ceremonial position. The new president, in turn, is to be elected within 30 days of the first parliamentary meeting. The constitution stipulates an aspiration of a two thirds majority for the election of the president but allows for a simple-majority run-off in case that requirement should prove elusive. This in turn means that it is the 163 mark that needs to be met in order to secure the election of the president and thereby get the government-formation process on track in earnest, with a deadline of another fifteen days for the president to formally charge the nominee of the biggest parliamentary bloc to form a government within another thirty days. In other words, if certification takes place around 1 April, a meeting of the new parliament must be held within 15 April, a new president must be elected within 15 May, a PM nominee must be identified by 1 June, and a new cabinet must be presented for approval of parliament before 1 July. The psychological deadline is likely to be the start of Ramadan around 10 August and the scheduled completion of withdrawal of US combat troops by 31 August. Iraq went to the polls on March 7 to elect its 325-seat parliament. While the final results of the elections have not been announced, predicting who will form the coalition government has already started. The official announcement about the election results is not expected to be made before March 18. However, it is already obvious that Prime Minister Nouri al-Maliki will not be able to secure a majority to establish a single-party government. The breakdown of the seats in the Iraqi Parliament is expected to be as follows: Some 100-110 for the State of Law Coalition led by Maliki, 85-90 for al-Iraqiya led by Ayad Allawi, 70 for the Iraqi National Alliance of the Shiites, 60 for the Kurdish Alliance, 10 for the Unity Alliance of Iraq led by Interior Minister Jawad al-Bolani and 10 for the Iraqi Islamic Party.Nevertheless, the results of the votes cast abroad between March 5 and 7 have become clear. The total number of these votes was about 270,000. In 2005, this figure was 400,000, with a participation rate of 71 percent. Yet, given the corrupt practices during the 2005 election, it is very likely that the 2010 figures are more realistic. The breakdown of the votes cast abroad in 2010 is as follows: the US 27,754, Canada 12,428, the UK 17,873, Sweden 36,931, Germany 19,474, Austria 1,579, Netherlands 12,300, Denmark 9,328, U.A.E. 14,063, Syria 42,965, Jordan 24,717, Iran 23,554, Egypt 4,917, Lebanon 3,787, Australia 12,068, Turkey 6,308 (Ankara 1,603, İstanbul-Fatih 2,913, İstanbul-Mecidiyeköy 1,291 and İstanbul-Kadıköy 407). A total of 636 election observers from 21 countries, the Arab League (70 observers), the Organization of the Islamic Conference (OIC) (40 observers) and the European Union (120 observers) watched the election of March 7. Iran was the only country that refused to send observers. The largest delegation of observers (106 people) came from the US. The US delegation, including some former senators, sent its observers to 26 spots around the country, including six spots in Baghdad. Being a country that had also sent observers during the 2009 election, Turkey ranked second after the US in terms of people observing the election with 46 election observers in 10 provinces — Baghdad (10 people), Mosul (13), Arbil (5), Sulaimaniya (1), Kirkuk (4), Vasit (1), Meysan (1), Dohuk (1), Diyala (2) and Basra (7). Those other than US and Turkish observers generally tended to stay in Baghdad or Arbil due to security considerations. On the other hand, Turks and Americans managed to have access even to the remotest and most problematic regions and neighborhoods and conducted their duties seamlessly. France sent five observers — three in Baghdad and two in Arbil — and three senators, while Italy sent 14, the Czech Republic and Japan 12 each. Except for the US, Denmark and Turkey, the countries tended to select their observers from among their diplomats working in Iraq. Only Turkey and the Czech Republic sent observers to Kirkuk. I was the only civilian observer in Kirkuk. Speaking to the election observers at Hotel Al-Rasheed in Baghdad on the evening on March 9, Maliki implied that they would eventually set up the government. He was considerably relaxed in his speech and attitudes. A widely shared fear in Iraq is: “If Maliki stays in power as a prime minister for another term, he will stay there forever. The country may shift toward dictatorship before democracy becomes institutionalized.” For this reason, political parties are trying to prevent Maliki from remaining while allowing the State of Law Coalition to be part of a coalition so that someone other than Maliki can become prime minister. However, it appears that Maliki is determined to remain prime minister at all costs. And he is open to all coalition and cooperation options based on his prime ministry. The fact that he exerts control over the military, the intelligence and the bureaucracy is making Maliki all the more powerful. A very hot month awaits political bargaining in Iraq. March 14, 2010It’s basically a MESS. A HUGE MESS.Too many contradictory statements from the Western Press and Arabic Press.I’ve been perusing Azzaman, Al-Sharqiya, Al-Jazeera and AP reports and I see no coherence. Let’s start with the ridiculous first. Yet the Iraqiya bloc has affirmed again that “that ballots were dumped in the garbage, nearly a quarter of a million soldiers were denied voting rights and electoral commission workers fiddled with vote counts“ but that it also filed complaints with the UN security council and UNAMI because innocent residents of Adhamiya (a Sunni area in Baghdad) are being harassed and arrested by the Iraqi army and that Al-Iraqiya candidates are being threatened, 7 days after the voting has been over. Prime Minister Nouri al-Maliki’s political coalition took an early vote lead Saturday in the election’s all-important battleground of Baghdad, pulling away from its two closest rivals in the latest indication that Iraqis want a moderate government instead of Shiite religious hard-liners leading the postwar nation. According to AP, Maliki’s Dawa Party is a moderate party and none sectarian, when the whole political issue s “national reconciliation” and its impossibility is precisely due to the sectarian character of Al-Maliki’s government and other Shiite parties, thanks to their application of the “sectarian quota system” (in Arabic it’s called Al- Mukhasasa El-Taefiyeh) – a phrase that is repeated by many Iraqis, but trust AP to deliberately ignore that fact. It is truly amazing ! But do read the article because at least it shows the mess of the HEC contrary to Al-Jazeera’s praise for it. AP is even more truthful than Al-Jazeera… Amazing again ! However, according to Al-Sharqiya quoting Reuters, (and this report is more accurate than both AP and Al-Jazeera) a spokesman for Maliki’s state of Law said that Maliki did not get enough votes to form a majority coalition government and is seeking an alliance with the Kurdish group and of course INA — as this other AP report clearly points out. It remains to be seen if INA will want to join Maliki or if they are awaiting fresh orders from Iran as stated in my previous updates. Maliki having talks with INA – well that’s expected. See link above. The typical, classical division as per the US occupier’s agenda – partition of Iraq into South, Center and North. For Nineveh these are the figures I managed to get : Iraqiya leading with 62’000 votes, Kurdish Alliance 19’000 votes, Tawafuq 9’000. State of Law 2’000 votes. In Kerbala, Maliki is leading by 15’000, followed by INA 6’940 votes, and Iraqiya 3’000 votes. In Basra, the special votes have been finally counted. But only the “special votes”. No one really knows what these “special votes” stand for. It can be the armed forces or the IDP’s or both..only God knows. Anyway, Maliki is leading in Basra followed by INA and Iraqiya is in 3rd place. And of course in Erbil and Sulaymaniya the Kurdish Alliance leads but mum’s the word on Kirkuk. Q.Aboudi of HEC has assured us that the votes for the provinces will be over by Sunday but that “some ballot boxes are quarantined” i.e held up and not included in the vote count. Again no reason given. But despite the mess and the regular bombs, Al-Jazeera assures us that in 7 days, the transformation for Iraqis has been striking and that Iraqis are very optimistic about their future — they were even filmed smiling and having a little fun in dried out parks, with hardly any grass, riding a merry go round…this must be liberation ! The theoretical re-ordering of the INA list on the basis of the partial results suggests that this kind of factor may indeed exist. It is noteworthy that in this material, Sadrist representation more than doubles among the top five vote-getters in each governorate as a result of the open-list system, increasing from 4 to 9. This is at the expense of ISCI/Badr in particular, which were dominant by default in the original 316 list (even though some Badr representatives in core areas like Najaf still do well), as well as Jaafari and Fadila, who both generally perform dismally in this material. Of the three governorates covered – Najaf, Maysan and Babel – only Maysan can really be described as a traditional Sadrist stronghold.